Come in! Don’t mind the mess. I say this reflexively. The house isn’t that messy, maybe a rogue shoe on the floor under the table, but certainly better than most days. I live by a similar motto. I offer you one of my favorite coffee mugs. I have a set of matching cups, but what is the fun in that? You pour yourself some coffee and we settle in on the couch. Your shirt still shows evidence of the rain that has been falling for hours, one of those nice steady rains. If it weren’t for the rain, we would be outside. Well, probably not. It was a little chilly, too. We talk about the weather and then we talk about how much we hate small talk, like talking about the weather. You tell me about the book you’re reading. It is an Agatha Christie book because you read my blog post about one of her novels. It isn’t the same one, but you are enjoying it. You agree she is a literary genius. I tell you about the race I ran last weekend. It was my first of the year and four miles. Three miles is usually my max, but I ran this race last year with surprising results, so I tried it again. I beat my time last year by one minute, 45 seconds. It was pretty exciting. After the race I went to a screening of The Breakfast Club. It is a movie I can quote pretty much word for word. I know all the glances and all the hand gestures and for some reason, watching it this time everything was so funny. I laughed almost the entire movie. I go off on a tangent talking about how when I taught a class on different forms of media, we discussed how the movie watching environment affects the level you enjoy the film. You say a person’s mood also plays a big part. I don’t disagree. The coffee in our cups is almost gone and it is time for us to leave anyway. We put our cups in the sink (I’ll wash them later), turn off the coffee pot, and we gather up our stuff. Coffee was just the first part of our fun filled day. We are off to enjoy the chilly, rainy weather. Thanks so much for the coffee. I read through Agatha Christie many years ago. I am currently on a Roald Dahl fest. Read Matilda last weekend and am now reading his 600 page bio. I don’t usually tackle such big books but read segments online and was riveted. Such a fascinating author. I haven’t read Roald Dahl’s biography. I will add it to my ever growing to-read list. Thanks for stopping by, Rowena! I love your mugs. I am always on the lookout for cool pottery mugs at garage sales and the Goodwill. We have some homemade pottery bowls that are my favorite. These were made by some potter friends of my parents and I adore them. As for the rain, we all take showers, right? Why not. Thanks for reading and commenting, Amy! I love all weather, including rain. 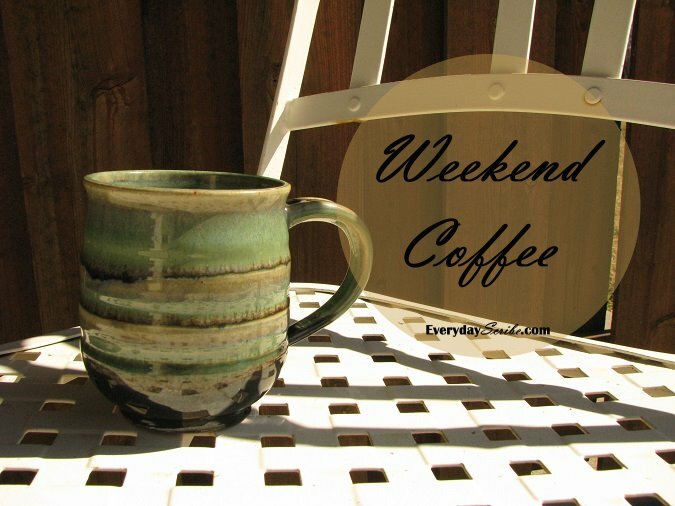 Plus, it makes for a great day to sip coffee out of a cool pottery mug. Yes, Agatha Christie is an super author good to read and over again. Glad youvran you race again and beat last years time.